One of our ongoing interests at Home Subjects is the intersection of the practices of collecting and displaying artworks. Collectors, particularly those who display their collections in private interiors, often portray their collections as perennial documents of family history and unfaltering taste. Yet many, if not most, collections were enabled by the circulation of art and other artifacts, due to personal, political or social upheaval and intensifying art market dynamics shaped by war, revolution and empire. These characteristics of collecting and accompanying exigencies of display are amongst the topics we hope to explore in a panel at the 50th annual meeting of the American Society of Eighteenth-Century Studies, to be held March 21-23, 2019 in Denver, Colorado. The CFP may be found here; proposals are due September 15. J.S. 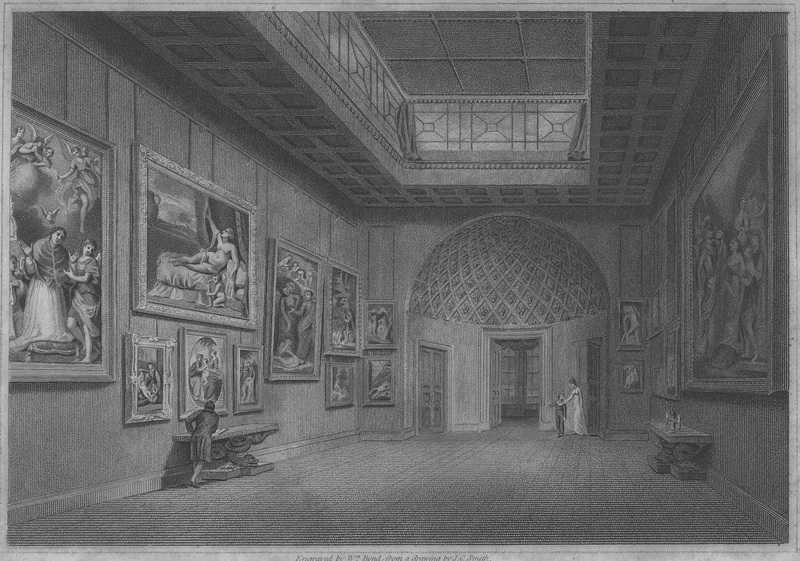 Smith, engr., View of the New Gallery Cleveland House, from John Britton, Catalogue Raisonné of the Pictures Belonging to the Most Honourable The Marquis of Stafford in the Gallery of Cleveland House, engraving on paper, 4 ½ x 6 ¼ in. (11.4 x 15.8cm), 1808, National Gallery of Art Library, Washington, D.C.
A case in point is the collection at Cleveland House, London, that the Marquess and Marchioness of Stafford opened to the public in 1806. The number and quality of pictures on display at Cleveland House was unlike anything available elsewhere in London at this time. Its rooms were filled with pictures by revered Old Masters such as Raphael, Titian, Poussin, Claude, and Annibale Carracci. A widely-circulated view of the New Gallery depicts Annibale Carracci’s Danae hung over a trio of paintings by Raphael and flanked by Carracci’s St Gregory and Descent from the Cross. Just beyond, and less easily discernable in this image, smaller canvases by Salvator Rosa and Correggio are also on display. When the gallery opened, The Marquess of Stafford was one of the richest men in Britain, with an aristocratic family lineage stretching back more than a century. One might initially assume that the collection displayed on the walls of his townhouse represented the collecting practice of a particularly diligent ancestor, or the acquisition of multiple generations. This however was not the case; the collection had been assembled largely over the course of the previous decade, by the Marquess himself and by his uncle, from whom he inherited Cleveland House in 1803. Indeed, a significant portion, about fifteen percent of the pictures on display at Cleveland House and almost all of the pictures visible in this engraving, had come from a single source—the collection of another family—called the Orleans Collection. The Orleans Collection took its name from the Ducs of Orleans, at whose Parisian residence, the Palais Royal, the pictures had been on display since the 1720s. much of the rest of the collection at Cleveland House, which numbered nearly 300 pictures, were acquired at the myriad sales of art that took place in the sales rooms of London during the 1790s. The Orleans collection was only the most widely publicized example of a French collection which found its way into a British house in this period. Many other collections were available for purchase, some of which were brought to England personally by people who then found themselves in need of cash. By the early 1790s, London was home to a large community of French émigrés, many of whom were members of the aristocracy and clergy who had fled to London even before the abolition of the monarchy. Emigres were frequently in need of money, and had only the possessions they had been able to bring with them as a means to acquiring it. As Cynthia Wall has argued, auctions of personal property were commonly regarded as moments to reflect on the sad circumstances which necessitated such sales. Louise Elisabeth Vigee Le Brun, Charles-Alexandre de Calonne, oil on canvas,1784. Royal Collection Trust. 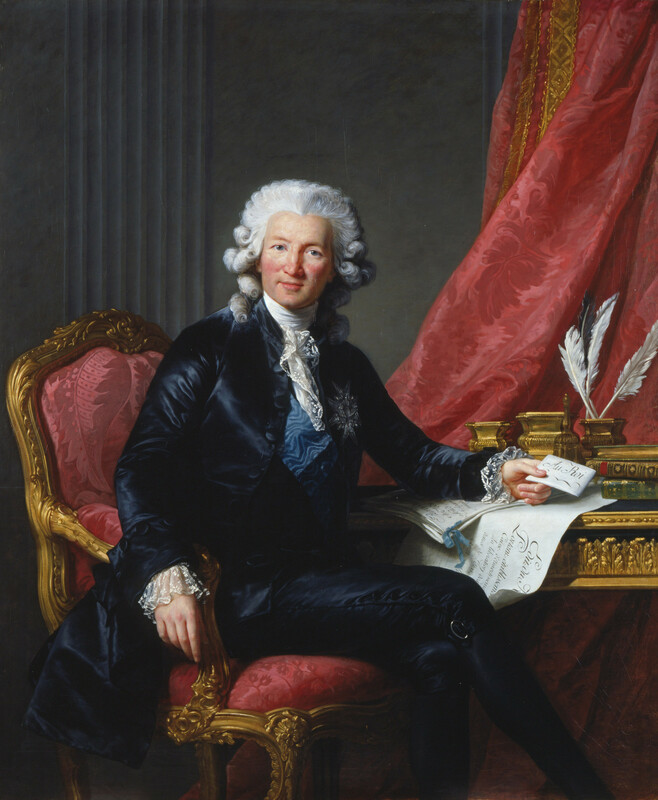 One prominent émigré whose picture collection came to the hammer in 1794 was Charles Alexandre de Calonne, former minister of the French treasury. Aside from the Orleans sales, the sale of Calonne’s pictures was perhaps the most celebrated to take place in this decade. Calonne, who had been exiled from France in 1787 as a result of his attempts to raise taxes to pay the national debt, had settled in London before the Revolution began. After he decided to sell his pictures, described in one report as “some first-rate performances belonging to an Emigrant Nobleman,” newspaper notices drew on his dramatic personal story to arouse interest in the sale, alluding to his “exile by Louis XVI” after which he “sought a safe asylum in England.” One writer noted poignantly that amongst these pictures were portraits of the King and Royal family of France, which had been presented to Calonne during his administration. Calonne’s story was one of proximity to royalty, symbolized by his ownership of portraits of Louis XVI and Marie-Antoinette, a position that would not necessarily arouse sympathy; but Calonne’s new status, as an émigré forced to raise funds through the sales of such possessions, elicted compassion. Henri-Pierre Danloux, Mademoiselle Rosalie Duthe, oil on canvas, 1792. Staatliche Kunsthalle Karlsruhe, Germany. Living among these émigrés was French artist Henri-Pierre Danloux, one of several celebrated artists who sought refuge in London. Angelica Goodden has noted that several of Danloux’ portraits from this period feature sitters holding letters and objects which convey the pain of separation from their homes and loved ones, a tendency on display in Danloux’s extraordinary portrait of émigré Mademoiselle Duthé. Danloux’s portrait is tremendously suggestive about the way pictures might function as mementos of loss. Duthé, whose full name was Catherine-Rosalie Gérard, was a celebrated opera singer, dancer, and courtesan with close ties to both the French royal family and an assortment of English and French noblemen, including George Wyndham, the 3rd Earl of Egremont. Danloux recorded in his diary that Duthé “…decided to pose in the attitude of a woman hanging a painting representing a Sacrifice to Friendship above the sofa in her Boudoir.” The resulting composition is unique, putting the act of hanging a work of art at its heart, an act which in Duthé’s case conveys special poignancy given that her own possessions and property in Paris had already been seized by Revolutionary authorities. Danloux paints her hanging a picture of a lady looking mournfully over an expanse of water, the channel which separated England from France. Martin Schieder has written that it likely represents the hopes of the émigré for French society and politics to return to what they had been, the white of her dress alluding to the white of the Bourbon dynasty. Surely it is also significant that Duthé’s hopes for restoration to her former station in life are represented not through an appeal to the public persona she had cultivated as an actress on the stage of the Opéra, but by hanging an artwork in the most intimate of private spaces, her boudoir. The restoration of possessions and belongings to a private interior stands in for the restoration of the émigré to her former position in society. 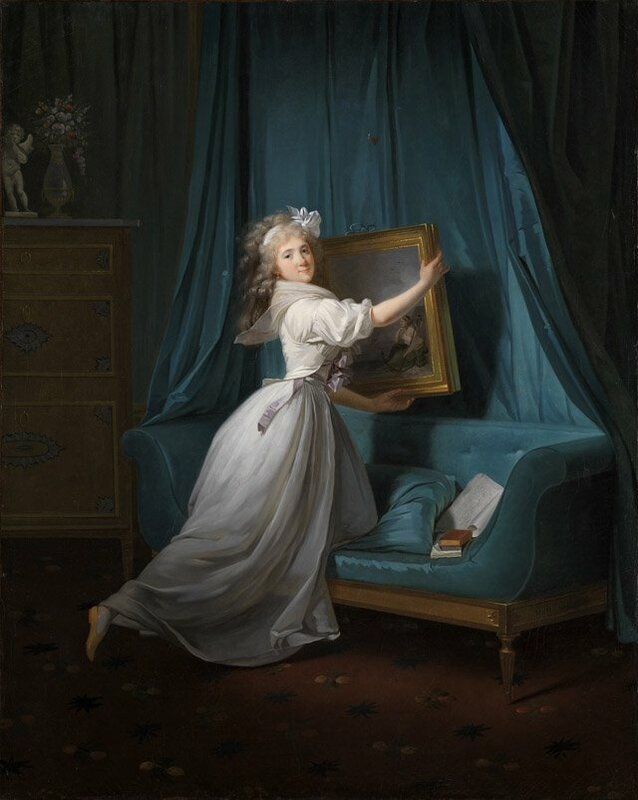 The act of hanging a picture, of actively installing it into this most private and intimate of spaces, also makes a statement about her arrival in English society. The piece of furniture visible in the left side of the picture has been identified as English marquetry, so it would appear that Duthé is making herself at home in her new surroundings. The picture, while not exhibited in public, makes a private statement about the émigré and her ambition to use objects and pictures to make a new home for herself in English society. The boudoir, one of the most intimate of domestic spaces, becomes a space to stage Duthé’s installation of herself into a new life. While on one hand this picture represents the hopes of the émigré for French society and politics to return to what they had been, Duthe’s active, even hurried, posture, may inadvertently conjure the image of a woman taking her own possessions to flee her home. Previous: The History of Interior Design as “Neglected Stepchild”?